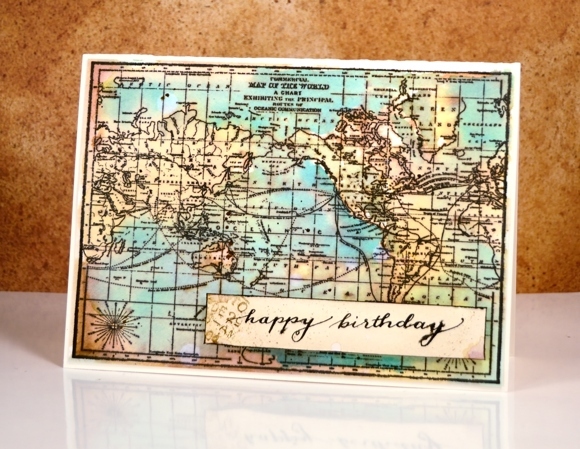 For today’s card I pulled out the Darkroom Door vintage style “Correspondence set” and the “World Map” stamp. This mosaic style card was made for the wedding anniversary of friends of mine. I chose the correspondence and map stamps because they are a couple who love books, travel and literary memorabilia. 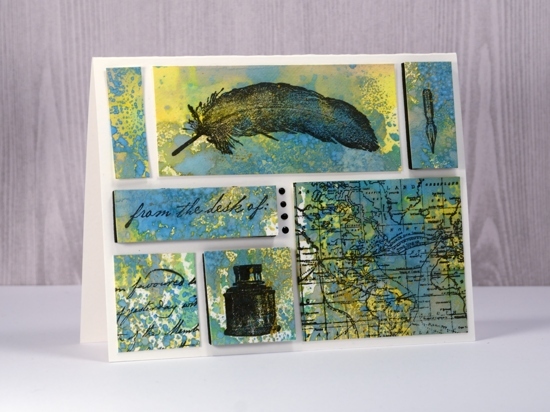 To create my background I used a layering technique featuring distress oxide inks. I pressed fossilized amber, broken china and cracked pistachio inks onto a craft sheet. I spritzed with water and pressed my hot pressed watercolour paper onto the ink. After picking up a layer of colour I dried the panel before laying it back into the ink to pick up more colour. By drying the panel in between layers I was able to keep the colours bright and distinct. Once I had layered enough colour I splattered some gold paint lightly over a few areas then let it dry. 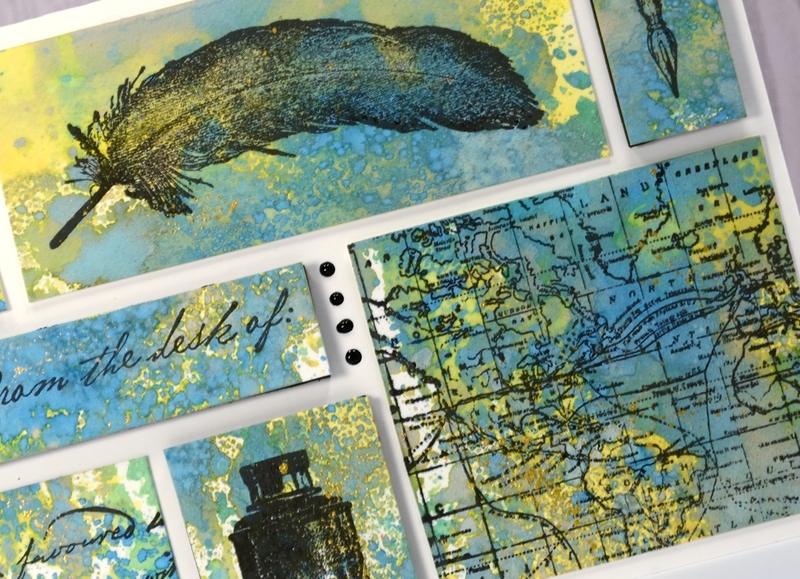 I chose several stamps from the Correspondence set and stamped them in versafine onyx black ink onto the distress oxide background. I also stamped the world map stamp so I could cut out a little map panel. 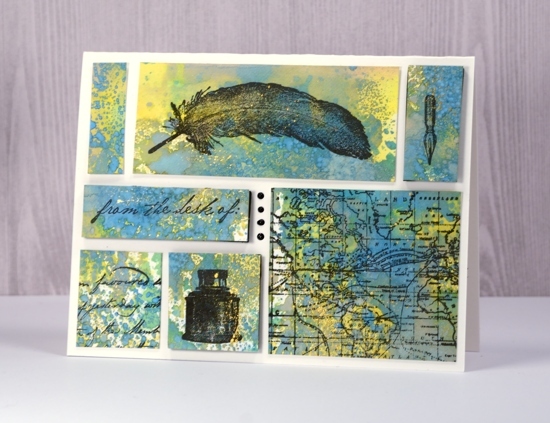 The next step was a bit like putting a puzzle together as I trimmed and arranged my stamped and unstamped rectangles to fill a natural coloured A2 card front. Once I was happy with my layout I added black foam to the back of three rectangles to add height and visual interest. I was left with one little space which I filled with four dots of ebony black nuvo crystal drops.